Many aspects of Bye Bye Birdie strike me as charmingly antiquated. 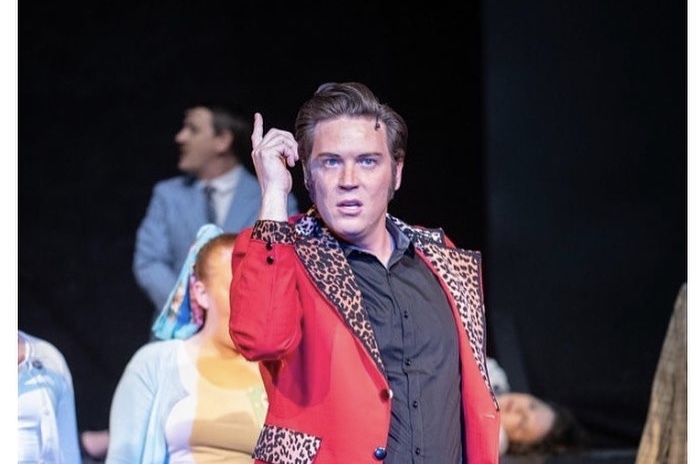 First off, the title role of Conrad Birdie (Mike Sorenson) is a send-up of Elvis Presley. Conrad’s manager and songwriter Albert Peterson (Justin Benson) is the stereotypical 1950’s boss, oblivious to the contributions of his secretary Rose Alvarez (Amy Lemon), who is also of course his girlfriend. When Conrad is drafted to the army and Albert is scrambling to make money off him to pay a debt, the solution involves flying Conrad to small-town America to kiss an adoring fan in a publicity stunt that will be aired on everyone’s favorite weekly variety show. Conrad is a hell-raiser, a womanizer, a narcissist, and a slob. But his public image is curated by the painstaking efforts of Rose and Albert, and the opportunities to nationally disgrace himself are limited to public appearances on the few ubiquitous platforms of the day. This feels far distant from the era of celebrity tweets. Today’s mega-stars are guided by a full entourage of stylists, managers, and bodyguards, yet fans get bathroom selfies and vacation updates via Instagram. It seems highly unlikely that a follower of Conrad Birdie in the 21st Century would be oblivious to the fact that he’s a vapid jerk. And yet, the more things change, the more they stay the same. As a teen, my two best friends fought zealously about the merits of their respective favorite boy bands: N’Sync and The Backstreet Boys. Though I was oddly immune to their mania, I absorbed an embarrassing number of facts about Nick Carter and AJ McLean. The teens of 2019 have all come down with Bieber Fever, and though he is widely acknowledged to be a vapid jerk, no one seems to much care. The screaming hordes will not be contained. Thankfully, women have vastly expanded their roles in the workplace and earned greater respect from their coworkers. Nonetheless, they continue to be frustrated about the lack of recognition for the work they do. Rose Alvarez would be quite at home with the masses of ladies who currently find themselves in long-term dating relationships with men that don’t hold up their end. Parents of any era will want to sing along to “Kids,” which laments the state of “today’s” youth, with the refrain “Why can’t they be like we were, perfect in every way?” Teens will be drawn to the young lead Kim McAfee (Brynn Larsen), who considers herself fully mature at fifteen and keen to let everyone know it. Not to mislead, Bye Bye Birdie is a lighthearted frolic. Its only agenda is to show you a good time, and it delivers. The doowop-y tunes are infectious, as is the enthusiasm of all those screaming fans. When Conrad sings on the steps of the courthouse (“Honestly Sincere”) girls aged 15 to 50 paw at him voraciously and are ultimately incapacitated by his appeal. It is a sight to behold. My favorite character was the irate but well-meaning Harry MacAfee (Andrew Bentley), father to Kim. He spends most of the play blustering about the lunacy inflicted on every female creature by Conrad Birdie. His wife Doris (Trisha Sorenson), tempers his turbulence while aiding and abetting their daughter’s obsession, and we the audience know she is as much indulging her own infatuation. (Sidenote: Trisha and Conrad’s Mike are in fact married off-stage. Imagine the dinner conversation!) A moment of delicious irony comes for Harry when he becomes equally starstruck. After learning that Conrad Birdie’s visit will involve him being featured on The Ed Sullivan Show alongside his daughter, he sings holy praises in “Hymn for a Sunday Evening.” I might have rolled in the aisles, had they not been filled with the candle-bearing worshippers of Mr. Sullivan. Everything you want to see from the 50’s is there. The teen ensembles truly set the stage: the girls in their flouncy skirts and cardigans, the boys with their rolled-up jeans and greased hair. Kim’s “steady” Hugo Peabody (Boston Anglesy) seems to have walked straight out of a Norman Rockwell painting. Rose’s classic wardrobe almost made me yearn for those days, women’s roles notwithstanding. The choreography is to be applauded above all. You will see the iconic quick-step side-by-side routines, and be reminded what a “triple-threat” really is. Men, women, and children all perform in remarkable synchrony, most impressively in “Put on a Happy Face.” Here, Albert (Benson) cheers the forlorn young Suzie (Sarah Nielson) by spurring her into a playful dance. Benson, whose day-job is a children’s speech pathologist, pegged this moment as his favorite of the play. It was one of mine too. “In real life, I work with kids…and I like making them happy so that’s a fun opportunity to be myself.” It’s impossible not to be happy watching Benson sing and dance, and impossible not to realize that men really can multitask. The 2016 film La La Landwas a hit because we’ve all missed these fanciful song-and-dance sequences. It’s a rare treat to see it in person. The play sits squarely on the very capable shoulders of Amy Lemon. Her character, Rose, is the engine that makes things work. It was a surprise after the show to see how tiny she is, as her stage presence is a good foot taller. The combination of Lemon’s size, her enormous smile, and her sweetly disarming voice (which belies a surprising vocal range) begs a resemblance to Kristin Chenoweth. She claims that she is “not a dancer.” After seeing her perform the climax to both Act One and Act Two, I wish I could be “not a dancer” of similar fashion. Bye Bye Birdie also rides on the vocals of many quality voices. Brynn Larsen does herself a great credit in her first role at Vernal Theatre: Live. The men’s ensemble of Charles F. Maude and his crew (Mike Sisto, Daniel Jackson, Cutler Rust, and Kindon Helco) are both soothing and rousing. And it turns out, the hysterical fangirls can do more than scream; Scottlynn Anglesey and Grace Christiansen stand out as particularly talented. One singular joy of attending any live production is seeing actors and actresses enjoying their role. Karilynne Pearson did it for me as Mae Peterson, Albert’s mother. Mae (and, I suspect, Pearson), is all too happy to show up at odd moments throughout the play in mismatched stockings, proclaiming poverty and loneliness from Albert’s neglect. She is not above climbing into a trashcan or lying across train tracks to drive home the point. The cringe factor ratchets up another notch for her racial profiling of Rose, who is hispanic. This could easily cross the line into offensive territory, if not for how clueless Mae really is. It is unimportant to her where Rose is really from, as she sees her only as “other.” This results in many eye rolls, and a few head-in-hand moments that add to the comedic landscape. Curtis herself is quick to share credit with her production team: music director Danni Harrison, choreographer Liz Nielson, and stage manager McKenna Christiansen. She was grateful to find people eager to take those roles early in the process, as the cast was predominantly teens and spring break was a week before opening night. They planned accordingly. “Our goal was to have the show ready to start running by March 20th. It wound up being very fortuitous because Mike Sorensen, who plays our Conrad Birdie, wound up having an emergency appendectomy the first day of spring break.” The show did go on, and though I knew all of this before seeing the play, I detected no lack of jive in Sorenson. He sung, swung, and swaggered worthy of the hyperventilating mob, at one time picking a lucky audience member for his advances.